Cats make great pets. Low maintenance, independent, but affectionate and cuddly- when they want to be. Cats enjoy taking their grooming into their own hands. They don’t need, or really want, any human help. This can be a perk and a drawback of having one. Occasionally, a cat might not be able to get the job done by their self. For instance, if they manage to get themselves a little more dirty or muddy. Or worse, they bring in fleas. This is when cat ownership can turn into a real hassle real quick. Have you ever tried to put a cat in a bath? If your cat is anything like mine, they are not especially eager to get wet. Also, if your cat has all its claws like mine does, this can raise a complete set of independent worries. Because, hey…those claws are really, really sharp. This doesn’t sound like much fun for anybody involved. But what are you to do? You can’t have a muddy cat dragging it around the house! Don’t worry. I manage to get my cat in the bath every couple weeks with no problem. Today I’ll share some of the best tips to make this as painless an endeavor as possible for both your and your feline companion. Maybe you don’t know where to start. As this doesn’t happen very often, you may not know where to start or find yourself asking can you even bathe cat?! 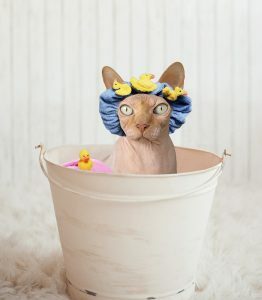 In this article we answer the key questions: when and how to give a cat a bath. First thing’s first. Let’s do whatever we can do outside of the water, outside of the water. Once you get your cat in the bath, you’ll notice a lot of shedding fur getting away from them. This causes an additional chore of dealing with the excess while also trying to give them a proper bath. By brushing them ahead of the bath, you can shorten the length of the bath and make the whole process smoother. Brush them well and make sure to get all that excess, shedding fur off before you even put water in the tub. Next, place them in the tub with only a little bit of water. This will be the hardest part of the whole process. Depending on your cat’s temperament, this could be sort of easy, or the hardest task of your life. But this will be the hardest part. Don’t go straight into bathing them right away. Just get them comfortable with their paws being wet. You can get in the tub too. Or just stroke them and coo. Don’t give them too much space or they may leap out first chance they get. Once they seem calm, run some warm water into the tub. You might find your cat distracted and intrigued by the flow of water. Cat’s seem to love running water for some reason. At this point, start running water over them with your hand and begin mixing in cat-formulated shampoo. You can rub the shampoo in gently now and then rinse. It’s important to be careful with their head. Don’t get water or shampoo in their eyes or ears. Nobody likes that. Here are some tips if you cat HATES water. Move slow. depending on how agreeable your pet is, this can be a very long process. Take it one step at a time, ensuring your cat is calm before moving forward. What I’ve found is the more often a cat is bathed, the less resistance you’ll receive each subsequent bath. Unless they have a truly bad experience. Speak to them. Let them know they are doing a good job. Stroke them throughout. Bring a toy into the mix. Let them play with their favorite toy beside the bath while you brush their fur out. Put a toy in the tub to hold their attention. Stay on top of them. Not physically ON TOP of them, but just don’t give them too much space. I’m not sure if it’s because they need you around for security, or if they are waiting to run away when you let them, but giving a cat too much space is a surefire way to make them abandon their bath. 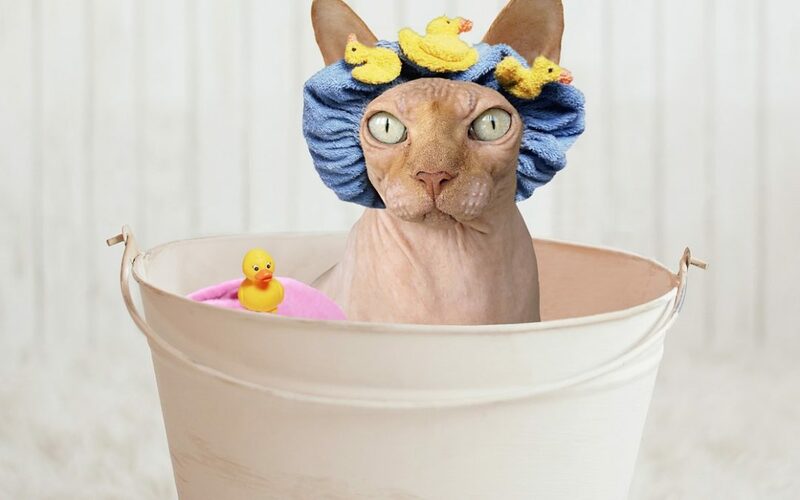 Once your cat is clean, your bathtub might not be. Use a general multi surface cleaner on the bottom of your tub. You can also use a lemon scented cleaner to freshen up the entire room. Always read the instructions and safety guidelines on the label.